In “The Grammy that nobody knows,” Classical Beat’s Anne Midgette recently shared her worries about this year’s seemingly random classical music choices nominated to receive a Grammy. Midgette is also concerned about a dissipation of traditional norms within the record labels’ marketplace, influencing tangible sales, as well as the reviews and critique sector along with it. But no matter what the greater implications for the music industry might be, the mood at Le Poisson Rouge’s Grammy Nomination Celebration in Lower Manhattan on December 16, 2010, was at an all-time high. 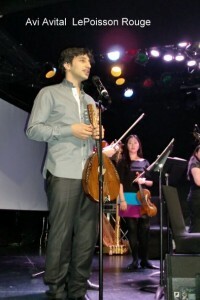 The young Israeli mandolinist Avi Avital had been nominated for a Grammy Award in the category of Best Instrumental Soloist Performance (with Orchestra). A beaming Avital explained that in this category the trophy is given to both the performing soloist and the orchestra’s conductor. The nominated performance, “Mandolin Concerto,” is part of a collection of “Concertos for Mandolin, Piccolo, Piano and Concerto Grosso” by Israeli composer Avner Dorman. (See also my interview with Dorman. 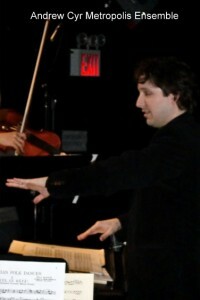 Conductor Andrew Cyr is the innovative mastermind and entrepreneurial energy behind the Metropolis Ensemble, a nonprofit professional chamber group of young and talented classical musicians, which formed around an intimate group of his supporters. Offering chamber and solo performances by classical musicians in alternative settings, groups like Metropolis take their art right to their audiences’ homes, proving that someone’s (albeit large) living room might be just as effective a venue as Carnegie Hall (if not more so). Cyr recognized the opportunity for “social marketing” of classical music by involving enthusiastic volunteers like Mrs. June Wu. Now a member of the Metropolis Ensemble’s board, she made her gorgeous Upper West Side apartment available for the ensemble’s last concert and almost 80 of its fans. Refreshingly enthusiastic about putting their skills to work, the Metropolis group is part of a new trend: musicians organizing performances in people’s homes or alternative venues. Often concentrating on contemporary composers, many of these performances extend the range of traditional classical music events. 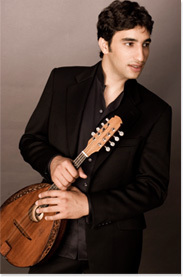 In perfect harmony with the credo to expand the experience of the classical spectrum, Avi Avital showed his mesmerized audience the incredible artistic appeal of his beloved mandolin with immense soulfulness and virtuosic skill. Pre-empting an actual Grammy decision, Avital’s mandolin, sharing center stage with a variety of other instruments, like the tambourine, the accordion, and the harp, became the undisputed winner of the evening. It is highly unlikely that anybody in the audience that evening will ever think of the humble mandolin the way they may have thought about it before hearing Avital play; he certainly changed my appreciation for it tremendously. The evening’s global offerings truly captivated the audience, starting with a baroque Bach concerto followed by Avner Dorman’s contemporary amalgamate and charismatic ‘Allegro’ movement, led by Cyr and members of the Ensemble. Spectators at Le Poisson Rouge were enchanted by the lyricism of Spanish song (DeFalla), and whisked away by a formidable and commanding performance of Middle Eastern rhythms by Avital and friends. Now, Avital’s Grammy nomination made all the more sense. Avital and Dorman are part of a constantly growing roster of talented young Israeli artists. Their careers have been fostered by the America Israel Cultural Foundation (AICF). This made it possible for them to further their education within their respective artistic fields, as well as develop their talents outside them. As David Homan, AICF’s Executive Director and a composer and collaborative artist in his own right, explained to me: “The sponsorship works on two levels: In Israel, with the early identification and support of all extraordinary artistic talent, and then in America, through further development and training or mediation of performance opportunities in corresponding venues. “The tricky part sometimes becomes the coordination of each one’s efforts—the ones in Israel and the ones that follow up abroad—in order to achieve the best possible outcome for the artist, which of course, is our common objective.” Working under AICF president, Bill Schwartz, and tasked by Vera Stern, wife of the late virtuoso violinist, Isaac Stern, who led the AICF from 1964 to 2002, Homan has been able to improve networking opportunities among the organization’s alumni. While Avner Dorman was able to attend New York’s Juilliard School as a student of the highly respected composer, John Corigliano, Avi Avital was able to expand his skills in the rare field of the mandolin in Padua, Italy. 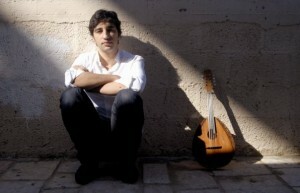 Always on the lookout for different mandolin repertoire, Avital had met Dorman in Israel. 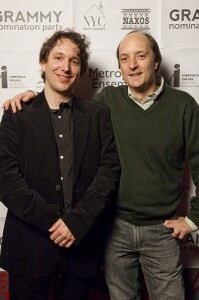 According to Avital, Dorman started working on a concerto for him in 2006, and finished it after a mere three months of fantastic interactivity between the two artists. Dorman’s artistic sensitivity allowed him to understand Avital’s personal approach to the instrument extremely well, thus creating a rare and fruitful meeting of two musical minds. The concerto was, in part, commissioned by the Israel Ministry of Culture and the Rabinovich Foundation, Tel Aviv, and co-commissioned by the “Festival Nessiah” in Pisa, Italy, where it was also premiered. The concerto’s recording was produced by six-time Grammy Award-winner David Frost and helped garner him a nomination as Producer of the Year, potentially leading to his third “Producer of the Year” title. Released by Naxos, the CD consists of a variety of concertos for mandolin, piccolo, piano, and concerto grosso, and also features pianist Eliran Avni, piccolo player Mindy Kaufman, and harpsichordist Aya Hamada. 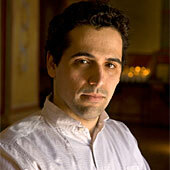 This is the second collaboration between composer Avner Dorman and producer David Frost on the Naxos label. In the course of being introduced to David Frost at Le Poisson Rouge, I had the chance to find out more about his connection to Avner Dorman. And what does the immensely successful producer of critically acclaimed recordings for all of the major labels—RCA, Sony, Decca, Deutsche Grammophon, EMI, Naxos—answer when I ask him how important another Grammy is to him? Just today, David Homan informed me that he has also found an enthusiastic sponsor in support of Avital’s presence at the ceremony. As they say: the first time is an once-in-a-lifetime experience. I couldn’t agree more. So sad to have missed the event but I’m very pleased to have been a part in a small way. Congrats to Avi, Andrew and Avner on their Grammy nom.